Fellowes is exclusively represented for North American speaking engagements by Boston-based American Program Bureau. Jessica Fellowes - the #1 best-selling author of 'The World of Downton Abbey' and its follow up, 'The Chronicles of Downton Abbey' - is set to begin speaking in North America. Fellowes - who is the niece of series creator and writer Julian Fellowes - is represented exclusively for North American speaking dates by Boston-based speakers bureau American Program Bureau. 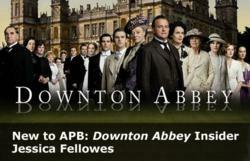 A prolific writer and public speaker, she plans to offer an insider's perspective of the show as well a look into the sociohistorical context of 'Downton Abbey' (particularly as it relates to the changing role of women, the rise of technology, and the crumbling of class hierarchy in post-WWI Britain). In her fascinating keynote speeches, she draws deft parallels between the world of Downton and the world of today. If you are interested in inviting Jessica Fellowes to speak at your upcoming event, contact American Program Bureau at 617-614-1600. In business since 1965, APB represents a roster of high-profile speakers from entertainers and politicians to thought leaders and academics. Learn more about APB at apbspeakers.com or follow us on Twitter @apbspeakers.